This reconstruction drawing by Pat Hughes shows the house of Robert Dene (who died in 1552) at 2 Church Lane, Stoneleigh, Warwicks, based on the inventory of his possessions attached to his will. 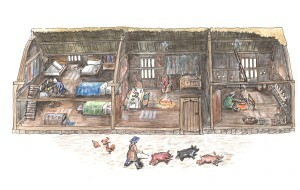 This names four rooms: the hall, chamber, solar (upper room) and kitchen, and the contents of each, including trestle table, benches, chairs, cupboards, painted clothes, cushions, tablecloth, wooden chests, beds, bedding, basins, candlesticks, pots, pans, hooks, chains, gridiron, spit, pewter and earthenware dishes, wooden trenchers, mortar, lead weights, and sides of bacon. Further insights into life in a peasant house come from 13th- and 14th-century coronerâ€™s inquests, which tell of children scalded by pots falling over on the open heath, chickens setting fire to the straw on the hall floor, a candle falling over and setting fire to bedding and a thief falling from a ladder while trying to steal a ham hanging from a beam. It used to be thought that only high-class houses had survived from the Medieval period. Radiocarbon and tree-ring dating has now revealed that thousands of ordinary Medieval homes are still standing in the English Midlands, many now incorporated into des res village homes. Chris Catling reports on how some peasants lived very well in the Middle Ages. The term peasant suggests poverty, ignorance, missing teeth and poor personal hygiene: Baldrick stuff, all threadbare rags, hunched shoulders and a life shared with pigs in a squalid hovel barely adequate to keep out the bitter winter wind. In fact, all that peasant really means is that you live mainly off the produce of your own labour. Many a modern allotment holder leads a semi-peasant lifestyle, and there are plenty of contemporary peasants all over southern and Eastern Europe not to mention those living in hippy communes in west Wales. For peasant, read largely self-sufficient.